Action Wildlife Removal provides professional raccoon, squirrel and skunk removal and wildlife control services in Mississauga. We offer environmentally sound and ecologically responsible solutions to both our residential and commercial clients. Our wildlife removal experts Mississauga are experienced and trained in animal removal services. We are here to take care of your wildlife problems in the most humane manner. Why Choose Mississauga Wildlife Removal Services? Removing wildlife animals such as raccoon and skunk from your property can be an arduous task. You need professional assistance for successful completion of the task. Which is why Action Wildlife Removal is here. You may find various companies claiming to be experts in wildlife control in Mississauga. But, remember, wildlife removal requires extensive knowledge and experience. Our in-depth knowledge and years of experience help us to undertake the most humane treatments for animal removal from your property. Our experts strive to offer the best solutions and 100% customer satisfaction. Setting your home or business free from wildlife is our ultimate goal. We understand that animals perform vital roles in all ecological systems. Which is why, we relocate them safely instead of killing them. Our professionals make sure to use the removal techniques that are safe for humans and animals. We will also guide you about how to prepare your home or business prior to an animal invasion. At Action Wildlife Removal, our main goal is to use the latest and innovative techniques to handle and control the confrontations between animals and humans. 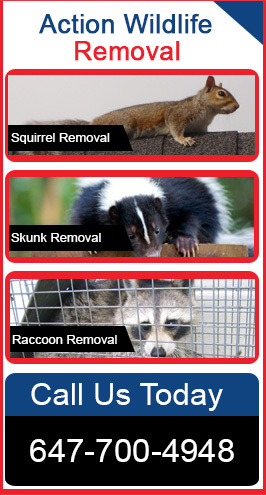 We can help you eliminate nuisance animals such as skunks, squirrels and raccoons from your premises. Our technicians will reach your place for thorough inspection and to locate the potential access points. Our wildlife removal solutions are customized as per the situation and need. We don’t take one-size-fits-all approach and bring change to our solutions as per the time and circumstances. Wildlife Animal Problem? Call Our Expert Mississauga Animal Removal Services Now.